adventure coexisted on a daily basis. for constructing the railroads to the rich living of kings and princesses in the Hawaiian Islands. It covers the Klondike Gold Rush, when sailors and their vessels sailed into the Artic Circle and the brutal gales of the Bering Sea. The reader sees the opening of the Pacific and Pacific Northwest through the eyes of Captain O’Brien. 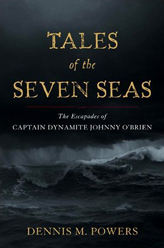 Tales of the Seven Seas goes into what brought about Jack London’s best-selling books, Call of the Wild and The Sea Wolf, that were published during the early 1900s—and who also met Captain O’Brien. Based on the actual journals of O’Brian, the stories are about tough times and hard men in distant places—and the history. Among his exploits, O’Brien narrowly missed being eaten by cannibals; had fought off Chinese pirates with cannon fire; had supped with the Royal Family of Hawaii; had made love to a Tahitian princess; had been offered a partnership by King O’Keefe, the famous white emperor of the island of Yap; and had shipped with the hairy and villainous Robert O’Malley, arguably the prototype for Jack London’s The Sea Wolf. O'Brien was revered in Alaska, because he was the one captain that didn't lose a ship and brought thousands of prospectors into the region along the Inland Passage. Along the way he became friends with Jack London, when the budding writer was making his way to the Klondike gold fields. He was a confidant of the builder of the Alaskan and Canadian railways, Michael J. Henley, who willed a monthly stipend to O'Brien, and of the famous, or infamous, outlaw Soapy Smith. He was called the “Nestor of the Pacific,” or one who by fist and spirit ruled the seas, and we applaud O’Brien and these men of the sea. These stories are about the sea, courage, failures, and overcoming incredible odds—which are so applicable today—but so sorely missed. © 2005-2014 Dennis Powers All rights reserved.